This is one of my all-time favorite movies. 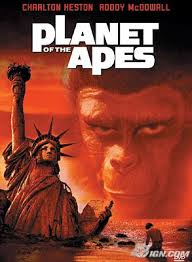 I have so many memories of watching all the Planet of the Apes films when I was a little kid. And yes, before you ask, I even watched the cheesy Return to the Planet of the Apes cartoon! 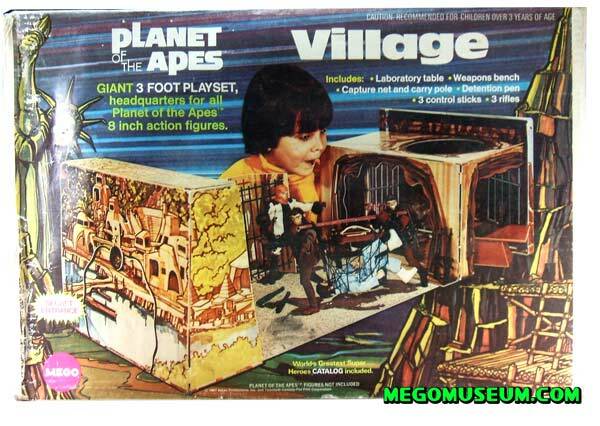 I even had the action figures and the Ape city village playset. Yeah, my parents were that cool, and if I’m being honest…I still have my Cornelius action figure. We even used to walk around swinging our arms like the chimpanzees did in that movie. While other kids were playing Cowboys and Indians, I and my friends were playing Planet of the Apes. Wow, that’s a big piece of the Bric puzzle falling into place! Watching this movie as an adult, it’s disturbing on a far greater level. With adult eyes it’s easy to see the satire of the human race that’s being acted out by the monkeys. First of all there’s a definite class system, a hierarchy based on species rather than individual merit. The monkey civilization is primitive (pardon the pun). Their technology includes guns, but not vehicles. The function of satire is to hold up to ridicule man’s follies in an attempt to improve human institutions or humanity itself. 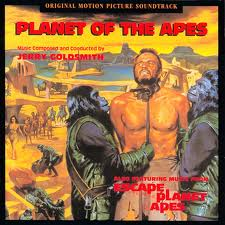 Planet of the Apes does just that by flopping our human world with that of one dominated by monkeys and apes. We see, however, that their society struggles with the same issues as ours does. For example, there’s a definite conflict between science and religion. 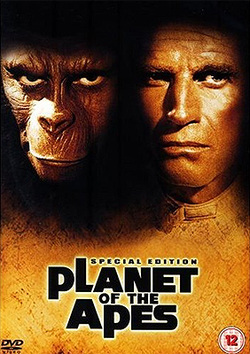 We see this when Zira, an animal psychologist experimenting on humans, says, “How can scientific truth be heresy?” Moments before, one of the heads of the “council” an orangutan named Dr. Zaius (a name frighteningly close to Zeus) says, “Man is a nuisance. He eats up his food supply in the forest, then migrates to our green belts and ravages our crops. The sooner he is exterminated, the better.” We don’t like hearing this because…well…because we’re men! But the very first act these astronauts do when they find a plant is to dig it up. Their first act is one of destruction. Byron wrote in Childe Herald’s Pilgrimage, “Man marks the earth with ruin.” Sounds like he agrees with Dr. Zaius. If satire’s function is to motivate improvement in humanity, I dare say this film’s impact seems negligible. We all know what it’s trying to say. Heck even Taylor says at the beginning of the movie, “I can’t help thinking somewhere in the universe there has to be something better than man.” The problem is, and through one of the most shocking twists at the end of the film, he realizes he has not traveled out into the universe. The horrible things he thought he’d left behind, all of humanity’s foibles and follies, he realizes are still in place. Only the players have changed. And actually, now that I think about it, they really haven’t. We ARE the monkey society. And that is truly frightening. Click on the word "soundtrack" to hear the Suite from the movie!